Perception is Reality: I was chatting with a major internet jeweler. And I asked him how the economic downturn was challenging his business. He looked at me sullenly, and said that they had to adjust their entire year forecast lower in February. But since they’ve done that, they’ve exceeded their monthly goals by 20% or more every month. So, he feels like business is FANTASTIC! In all seriousness, he did say that they aren’t seeing a ton of growth, but they planned for a sales decrease, and are seeing some strong single digit sales increases over last year in volume and dollars. The merchandise mix is on the lower end, and average order value has dropped, but sales are increasing. Discretionary dollars did not go away, he opined, but rather turned into smaller purchases. I think that many retailers would agree that people didn’t stop spending, but rather, they adjusted their spending downward. And for flexible merchandisers, who were able to make those adjustments, the downturn has been very manageable. Social Media is Everywhere: There were tweetups, live blogging, Facebook updates, and twittering everywhere. What I noticed is that there were individuals who were seriously engaged with social media on a personal level, but there were few retail brands that were really talking about it. The notable exception is #480 on the Top 500 Guide, Lion Brand Yarn, who says that social media brings in customers that have conversion rates as high as 20%. And those customers who are social media are 83% more likely to be loyal to the brand. (At SpinShark, we do social media management for top retailers, and we can vouch for similar results.) I am really interested in hearing your feedback on which retail brands are doing social media the right way. The economic downturn has not scared away the 4th Quarter: Like the infamous Grinch, the economic downturn has not scared away the 4th quarter. It is still on its way. Regardless of how bad the 1st, 2nd and 3rd quarters were or will be, all of the major gift giving holidays are still coming, and retailers have to get ready. So, retailers of all shapes and sizes were busy looking for the solutions that would give them an edge for their upcoming busy season. And you know what? They were all happy! Retailers have a love/hate relationship with search: Retailers love the exposure that search can get them. They hate the dependence they have on search (and especially paid search). For many retailers, search is the primary exposure they get on the internet. And many retailers feel like effective search visibility is contrary to their brand objectives, reducing their carefully crafted brands to various search feeds and search strategies that emphasize the breadth of search rather than what makes them unique in the marketplace. And as a search guy, I can appreciate that. 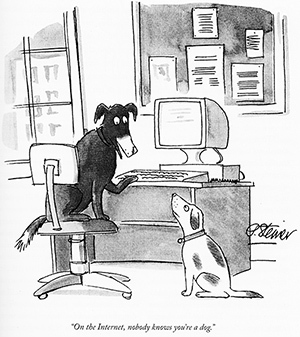 The internet (and search especially) makes the “Nobody knows you are a dog” phenomenon strike right at the heart of branded retailers. I will talk about this issue more in depth soon, but I heard such excitement and resignation about the necessity of search that I was amazed. Mobile Has Arrived: From 1800Flowers to Amazon to S’Lifter there is a burgeoning crop of mobile applications. Retailers are starting to take advantage of the immediacy, always-connected nature of mobile devices. Although the revenue is small, hopes are sky-high, and almost every retailer has dreams of their own iPhone app in the app store. This is hot. IRCE was full of excited and passionate retailers who want to build communities, are optimistic about the near-term future and are thrilled about mobile. There are others who are concerned about the viability of brand building in a flat internet age, and that search is a double edged sword. I am thrilled with what I learned, the people I met and the opportunities that we have all to discover!